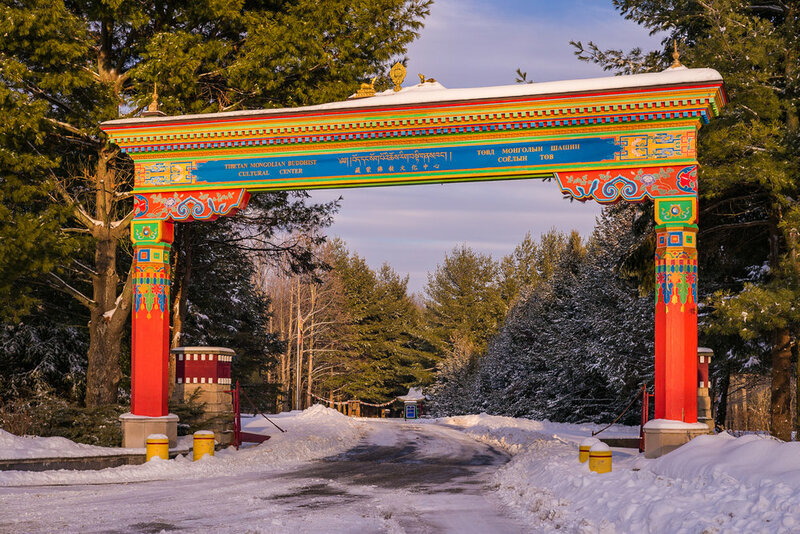 Located in Bloomington, Indiana and situated on 108 acres of gently rolling upland terrain, the Tibetan Mongolian Buddhist Cultural Center (TMBCC) is home to Kumbum Chamtse Ling temple and Kumbum West, a growing monastery which is the permanent residence of six Buddhist monks of the Gelug tradition of Tibetan Buddhism. The Venerable Lobsang Tubten Jigme Gyatso - recognized as the 8th Arjia Rinpoche - is a high ranking Tibetan Buddhist lama of Mongolian ancestry; he is TMBCC’s director, having been appointed to that post in 2006 by His Holiness the 14th Dalai Lama. In the Gelug tradition of Buddhism, “Rinpoche” is a title given to a Tulku - a reincarnated holy man or Lama. When he was two years old, Arjia Rinpoche was recognized as the 8th reincarnation of the father of Lama Tsong Khapa, the great thirteenth-century Buddhist reformer, scholar, teacher and founder of the Gelug tradition of Tibetan Buddhism. Under Rinpoche’s guidance, TMBCC has grown over the years and continues to fulfill its mission of fostering and preserving Tibetan and Mongolian Cultures in the United States, as well as helping to preserve cultural and Buddhist traditions among the Tibetan communities in exile. TMBCC is also charged with providing education in Tibetan and Mongolian cultures to the Bloomington community and beyond, and fostering cultural exchange between Tibetans inside and outside of Eastern Tibet. With with the intention of fulfilling its mission of cultural exchange and education, TMBCC is currently hosting the 2018-19 United States tour of Gelug monks from Labrang Tasha Kyil monastery which is located near Deradun, India. This group of monks are currently touring the midwestern United States to present cultural performances, workshops and teachings which showcase the rich cultural heritage of the Gelug tradition of Tibetan Buddhism.